Low quality materials: some manufacturers blindly reduce the production cost, and the use of inferior materials causes the crack of inlet valve outlet and inlet pipe itself when injection molding, leading to the failure of sealing. The miniaturization of water tank fittings leads to insufficient buoyancy of float ball (or float drum). 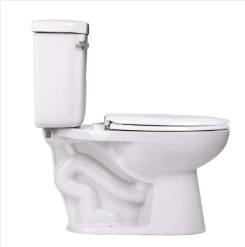 When water submerges float ball (or float drum), the water inlet valve cannot be closed, which makes water flow into the water tank continuously, and finally causes water leakage from the overflow pipe to the toilet seat.Especially when the water pressure is high, this phenomenon is particularly obvious. For example, when the water tank releases water, the backwardness under the float ball and float rod affects the normal restoration of the upturned plate, causing water leakage.In addition, the floating rod is too long and the floating ball is too large, causing friction with the water tank wall, affecting the free lifting of the floating ball, resulting in the sealing failure and leakage. When you pull the handle from the tank to flush the toilet, the starting lever in the tank is lifted.The bar pulls the string up, allowing the string to pull up the ball plug or rubber cover at the bottom of the tank.In this way the water level of the barrel cylinder will be higher than that of the curved pipe. When water gushes out of the tank, the float ball floating on the water surface of the tank will drop, pulling the float arm down, thereby elevating the valve plunger of the float valve device and allowing water to flow back into the tank.Water always flows down, so the water in the tank pushes water from the tank into the tank, which then flows into the drain pipe, creating a siphon that takes everything out of the tank.When all the water in the cylinder goes away, the air is sucked into the elbow and the siphon stops.At the same time, the ball plug of the water tank will fall back to its original position and close the opening of the water valve. Step 1: lift the boom up.If the water stops flowing, the problem is that the float cannot be raised high enough to push the plug into the float valve.One possible cause is friction between the float and the side wall of the tank. If this is the case, bend the float arm slightly so that it leaves the side wall of the tank. Step 2: if the float does not touch the tank, hold the float arm and do not let it go. Then turn the float counterclockwise and remove it from the end of the float arm.Then shake the ball to see if there is any water in it, because the weight of the water will prevent the ball from rising normally. If there is water in the ball, please throw the water out and reinstall the ball on the arm.If the float is damaged or corroded, please replace it with a new one.If there is no water in the float, put the float back in place and gently bend the float to a low enough position to prevent new water from entering the tank. Step 3: if none of the above steps can solve the problem, check the water tank plug at the flush valve seat.The chemical residues in the water may cause the ball stopper to not move to the right place, or the ball plug itself is rotten.Water will seep from the opening of the water valve into the bucket tank below.Close the shutoff valve of the toilet, then flush and empty the tank.You can now check the tank plug for signs of wear and tear and install a new plug if necessary.If the problem is a chemical residue that accumulates at the opening of the water valve, remove it with some emery cloth, wire brush, or even a knife that is dipped or not dipped in water. Step 4: if there is still too much water flowing through the toilet, it can be that the guide device of the lifting cistern ball plug or the lifting steel rope is not aligned or has been bent.Please make sure the guide is in the correct position and the steel rope is directly above the water valve opening.Rotate the guide device until the cistern ball plunges vertically into the opening.If the hoisting rope is bent, try bending it back to the correct position or replacing it with a new one.Please make sure that the starting rod does not cause friction with any part, and the lifting rope is not in the wrong hole in the rod, both of which will cause the water tank ball plug to fall at a certain Angle and cannot plug the opening.